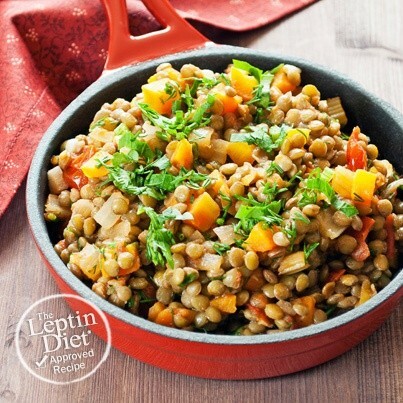 This is a Leptin Diet® Approved Recipe because it's high protein and high fiber and it uses herbs, fresh vegetables, and olive oil. Put enough water in a saucepan to cover the lentils by at least 1/2 inch and bring to a boil. Add lentils. Reduce heat, cover and simmer until tender, about 20 minutes. Drain. In a skillet heat the olive oil over medium-high heat. Add the carrots, celery, leeks, tarragon, thyme. Season with sea salt and pepper. Add chicken thigh. Saute until the carrots are tender and chicken is cooked, about 8-10 minutes. Remove from the skillet and set aside. Return the lentils to the saucepan they were cooked in. Add the vegetables and chicken to the lentils. Mix the champagne vinegar, olive oil, and mustard together. Stir into the lentils and coat. Cover to keep warm while cooking eggs. Cook the eggs sunnyside up (leaving part of the yolk runny). Divide the lentils between two dishes and top each with an egg.